SBM (Shibang Industry & Technology Group Co., Ltd.) will attend The Big 5 Saudi 2018 , It is a great pleasure to invite you to visit our booth there. To quickly collect the running situations of previous production lines, SBM pushes out a special after-sales service called "Quality Tour". What is it? SBM (Shibang Industry & Technology Group Co., Ltd.) will attend The Philconstruct 2018 , It is a great pleasure to invite you to visit our booth there. 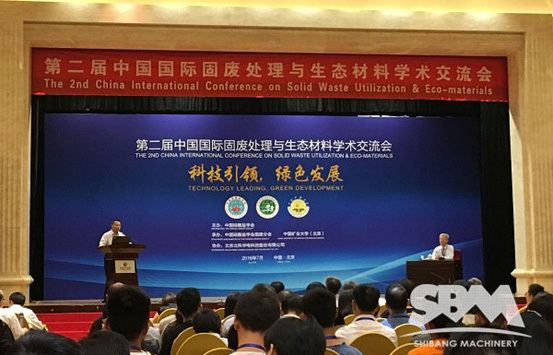 On December 9th, the 4th China International Aggregates Conference was held in Xuzhou, Jiangsu Province. Themed by "Green, Intelligent Manufacturing, Integration, Sharing", this conference welcomed not only related domestic government leaders, experts and enterprise representatives in aggregate industry, but also some international guests from Britain, South Africa, Spain, Singapore, India and some countries which participate in the "B&R Initiative". Under the background that concrete price is soaring and environment protection is highly emphasized, the 14th China Commercial Concrete Forum, themed by "Choice in Changing Situations" was held on November 5, 2017, in Shanxi Province. SBM (Shibang Industry & Technology Group Co., Ltd.) will attend The 122th Canton Fair 2017 , It is a great pleasure to invite you to visit our booth there. SBM (Shibang Industry & Technology Group Co., Ltd.) will attend The 5th International Construction, Power & Mining Exhibition 2017 , It is a great pleasure to invite you to visit our booth there.